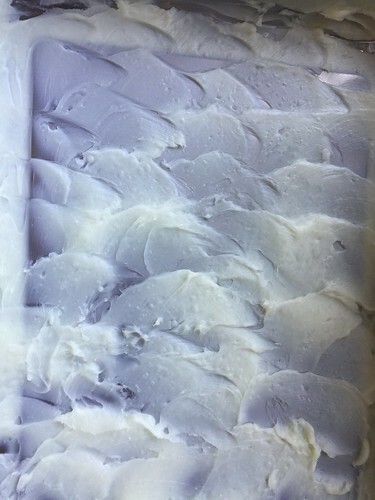 This spring, I have been experimenting with vegan enfleurage (the traditional enfleurage uses animal fats - ideally a combination of lard and tallow; which as a vegetarian I'm not interested in using). I tried different vegan fats (oils that are solid at room temperature), which I slabbed on a stainless steel pan with a lid (the kind you'd use, steeped in a hot batch, in catering carts to keep the food warm). 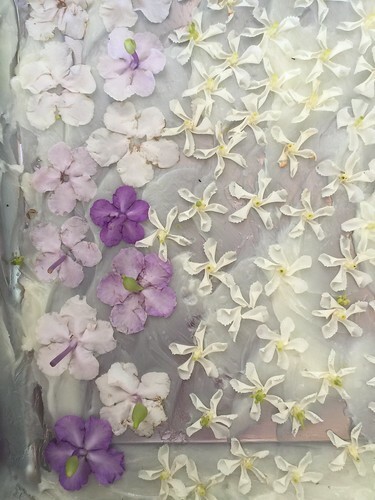 I smeared both the lid and the tray with fat, so that the flowers get encapsulated by the scent-absorbging fats, an you can truly capture some of the "headspace" of the perfume. After all, this is what enfleurage is all about! 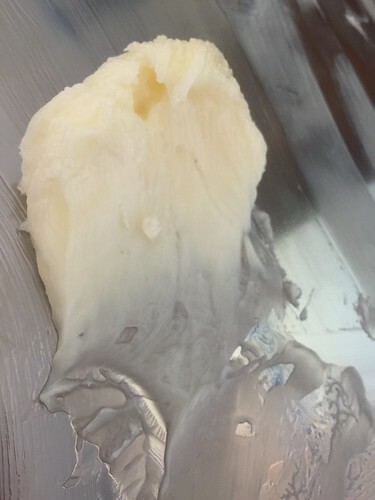 I tried different fats - such as palm, shea butter, coconut oil, etc. 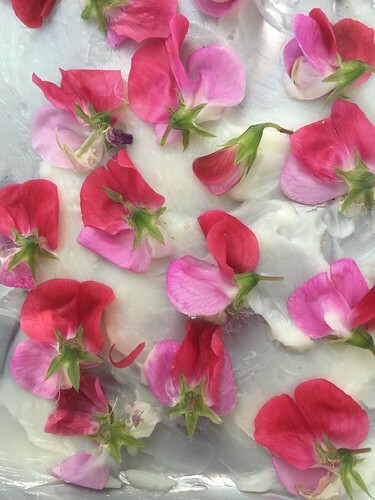 with varying results and also different challenges in the process, which I feel compelled to share here in case you want to experiment with your own enfleurage with your flowers. So, in the end, I created mixed trays of flowers, whatever I had on hand that was blooming, and paid close attention to the time of the day when it's best to capture them. Some are best early in the morning (not too many, actually), others you'll need to wait till the sun is shining (late morning). 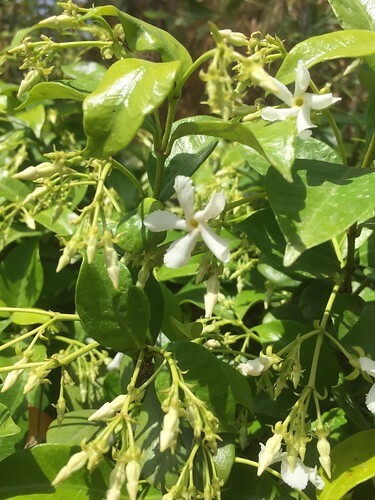 The Trachelospermum jasminoides flowers give their very best incensed-ambery-jasmine in the afternoon. And some, like the gardenias and Brunflesia, truly are best at night. The sweetpeas and Buddleijas davidii are most forgiving. But all are also favoured by tiny, minuscule bugs, which I found some ways to reduce, but very few ways to completely avoid completely. After changing the flowers for several batches, of the course of a week or more I got what is technically called "Pommade". 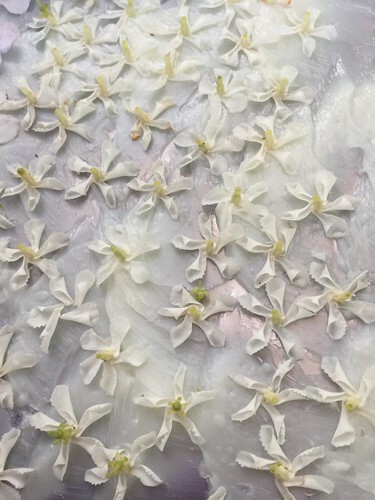 This is the fats saturated with the flowers' perfume. But to get to this phase you got to be utterly careful not to let the flowers overstay their welcome. You must change them every two days. Also, you must pay close attention to not allow any mould to form. The problem is, there is not a lot of ways to know when the mould will form - until it actually started. 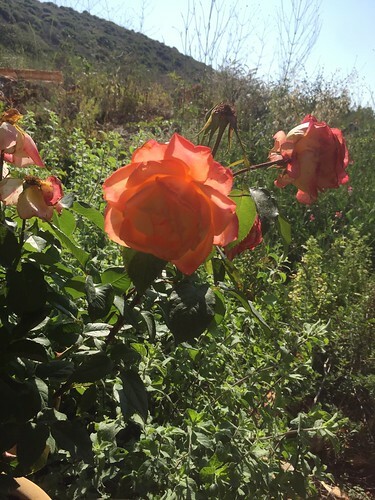 The literature I found about enfleurage talks about only week-long processing of the flowers, changing them every two days. But the fats did not have that much fragrance after a week. Also, mould could form within that week, depending not he amount of moisture in the atmosphere - and in the flowers. The pommade is then washed with alcohol, or to be more exact: it is melted over low heat bain-marie with alcohol. Allowed to macerate for additional ten weeks. Then chilled and filtered. 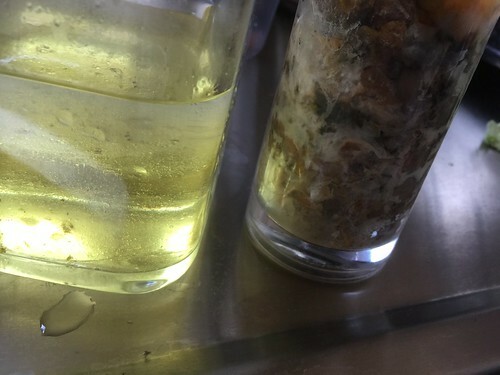 What you see in the image below is the warmed fats in the alcohol (on the left) and the spent flowers (the beaker on the right). The spent flowers can be composted, or extracted with absolute to create an "absolute from chassis". 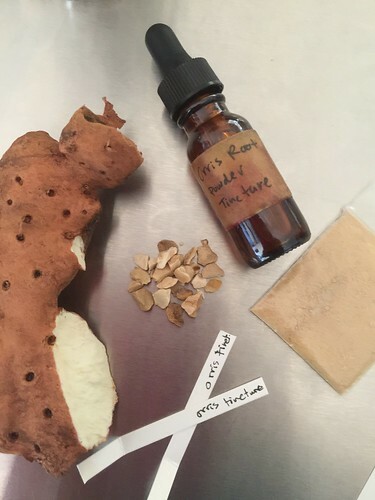 The resulting alcohol is really a perfume - alcohol with the plants essences in them. This is what you'll find in many old formula book labeled as "extrait of tuberose", "extrait of jasmine", and so on and so forth. This is not the complete process, but this is probably where a home enfleurageur should stop, to avoid unnecessary loss of material. And especially, if you're intending to use this in alcoholic perfumes anyway. Serious (read: commercial) enfleurage manufacturers would go on to evaporate the alcohol (preferably with a still, and in such way that they can re-use it), and will be left with an uber concentrated absolute from enfleurage. With all the heat waves I've survived in the past couple of years, my Philosykos is beginning to dwindle down. So, I have decided to seek out a new fig fragrance. I love Philosykos, a green fig fragrance that is very refreshing in hot weather. Like wading in a cool pebbled stream, and enjoying the shade of fig trees and towering oleander bushes. It lasts very briefly, and so I thought why not get a stronger fig scent? Premier Figuier was created in 1994, and was not only the first fig fragrance, but also one of the first by Olivia Giacobetti (the year prior to that she debuted her career with Petit Guerlain and Eau de l'Artisan). I have a sample of this first fig, and always liked it but not enough to purchase a bottle: it's milky, coconut and powdery and lasts even less than Philosykos (which is also by Giacobetti, and very light, which is excellent quality for summertime, but also limits it to this season for me). The latter has an Eau de Parfum version that is wonderful and longer lasting, but simply not available around this part of the world; and so when I stumbled upon Premier Figuier Extrême in the website of the nearest perfume boutique, I decided to purchase it unsniffed (the actual location near me didn't have it, so that's why I didn't smell it first). When it arrived, I immediately had a buyer's regret, because I should have known better than to purchase something with a similar name to something I like and expect it to end up well. I decided to pick up the scent, not open it, and go to the boutique that is a little more far away and sniff them side by side. But, of course, I couldn't not open a bottle of new perfume sitting on my desk. So I undressed the box from its cellophane wrap, released the bottle from its carton embrace and spritzed just teeny tiny bit on one wrist. Well, this is neither smelling like Premier Figuier; not like fig of any shape for that matter. Instead, I got this exotic whiff of the spice market, a swirl of incense and maybe some crushed fig leaves very far in the backdrop. To replace Philosykos clearly it can't. Nevertheless, I was intrigued. 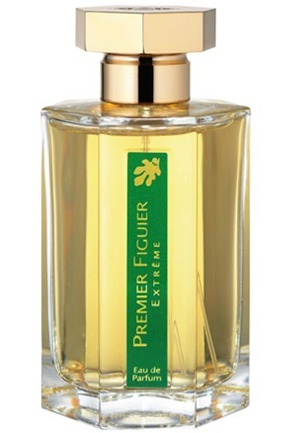 Premier Figuier Extrême begins with a trail of delicate incense smoke, intertwined with spicy-floral undercurrent. It is dry and warm, yet also soft and sweet-balsamic (I am smelling Peru balsam to be more specific). There is a surprising smokiness to it that brings to mind Dzing! 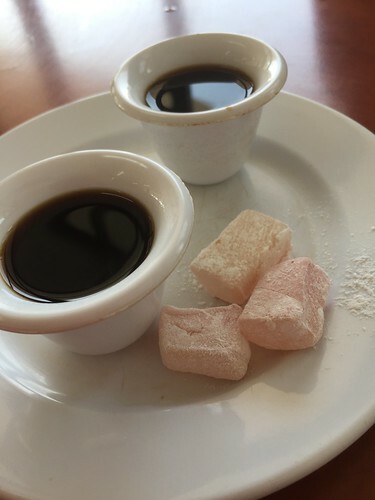 or perhaps Tea for Two (also by Giacobetti, who must have some kind of a signature I am yet to decipher), and much less of the powderiness of the original with its coconut note which I found distracting and a bit too soapy and watery-aldehydic. While the two are marketed as different concentrations of the same theme (Eau de Toilette and Eau de Parfum), and share almost all of the notes (minus the asafoetida note in the original), such as almond milk, coconut, sandalwood, fig leaf, dried fruit and fig wood - I find them to be almost as different as night and day: PF is watery, thin and luminous, with abstracts hints to the milky latex that streams out of the young tree. It is not even quite a tree yet, but a sapling that grows by the water stream, with the cool watery air coming off the wet pebbles. 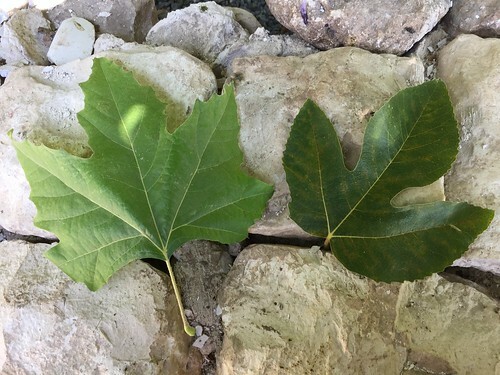 PFE is rather expansive, surprisingly full-bodied and with a sultry, sulphuric air to it, and I am wondering if this is part of the allusion to the fig fruit. This makes me wonder if the asafoetida note is not wrongly listed and actually belongs to the Extrême. It is mentioned this way on Fragrantica. It is not so much like ripe figs (and definitely not purple!) as stated in some of the copy writing, but more of a conceptual perfume, an interpretation of an interpretation. I imagine the perfumer revisiting her creation almost a decade later to tweak and upgrade the formulation to make it longer lasting - and gets carried away creating a completely new (and improved!) interpretation of the fig theme. This time the fruit is ripe, rich, full and the tree it grows from has matured to have thick, huggable trunk and more sturdy branches. It has become a home to several song birds and gives enough shade to rest under and cool off, even though it's not even close to any body of water. On the contrary: Maybe someone is burning a fire near it, and roasting some summer fruit on its flames. There is the aspect of contrasting textures, also, which is what I find most intriguing about this scent. There is the feeling of being surrounded by fine incense smoke, and at the same time a bracing touch of bumpy fresh fig leaf. A delicate, powdery, almost honeyed sweet floral haze and also the pulling apart of fruit to reveal its minuscule slimy tentacles inside. The polished dusty feel of a silvery fig tree trunk, and at the same time the oozing white milky watery sap. All in all, I'm pleased to say this has turned into an intriguing blind purchase which I'm happy to embrace into my collection and wear in this strange late spring, which keeps jumping from one extreme to the next: thunderstorms and humid cold rainy days, followed by hot dry desert winds, and replaced again by muggy humid days and more showers sprinkled in between. It's light-textured yet rich with nuances and I'm happy to discover different things within it in both cooler and warmer days. 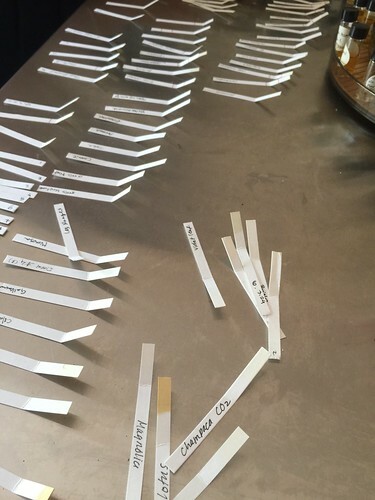 A word about comparative sniffing: When trying something blind for the first time and without any preconceived ideas, you have the advantage of being able to form an impression that is free of opinions, marketing intentions and other biases. If I was to be told "this is a fig fragrance", on the other hand, I would be looking for the fig and finding it thanks to the power of suggestion. 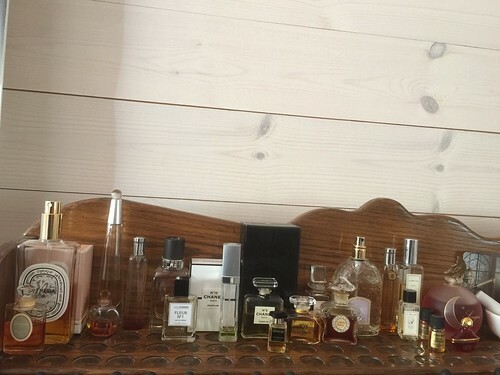 It is a bit tricky to compare similar fragrances side by side. 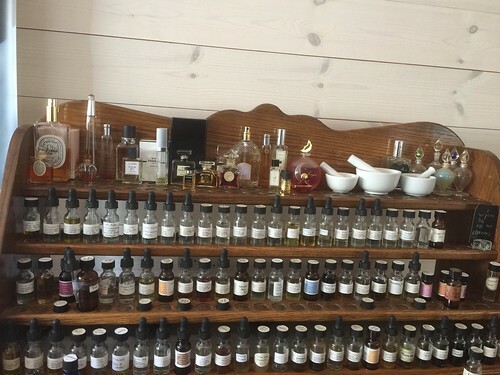 It may be an excellent exercise for a professional perfumer or a perfumery student trying to refine their olfactory discerning abilities. But for a layperson just trying to find a scene they enjoy, this can be utterly confusing and totally ruin the fun. Instead of smelling it for what it is, you smell it in comparison to something else that it is "supposed" to be similar to. And by doing so, what happens is that you find less of what you were expecting to find, and if that was what you're after - and don't find it - this is a sure method to feel disappointed. About fortnight ago, a night before starting my two-weeks of teaching perfumery courses, I was blessed with an unexpected visitor: An unrecognizable snake. Fear got the worst of me. I grew up here and know that there is only one poisonous snake around, and exactly how it looks (a viper). However, I wasn't around for many, many years and with climate change - who knows, maybe a colourful desert snake decided to migrate to the Galilee?! The striking colours of the snake made me especially frightened (usually they are a warning sign for danger). 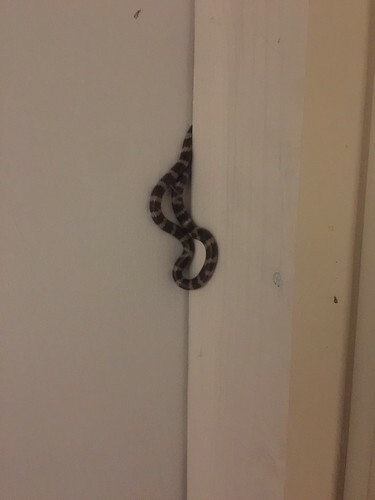 And also the fact that it got into my home and was coming out of a very narrow crack between the door's frame and the wall (as you can clearly see in the photo). I immediately snapped the photo and sent to my family, and called my brother to come and help me out. He got here so quickly, without even checking the photo, and in the meantime - the snake started to move. Which frightened the hell out of me... So I quietly and swiftly came up with a murder plan and started whacking the snake with a metal dustpan I use for clearing the ashes out of the wood stove. By the time my brother arrived, I was already convinced I killed the snake. And he sadly told me this is an erdviper, in Hebrew מחרוזן דו-גוני או מחרוזן הטבעות, AKA Müller's black-headed snake (Micrelaps muelleri). It is not dangerous to people (although it does have venom, but in it's back teeth - so it's very rare to get fully bitten by it). It's a snake that is only active at night, when it would go hunting for various bugs, spiders, mice and smaller snakes, and spends the days under rocks. Being more comfortable handling reptiles than I am, he picked the snake and discovered it is actually still alive. He released it in the garden, at first the snake did not move much but then crawled away and was never seen again. This encounter left me shaken and with many mixed feelings. First of all feeling very guilty that I injured this snake. Then also very perplexed and surprised about the powerful, visceral fear I felt finding a snake in my home. Then about the degree of aggression I was willing to perform against a creature I don't know anything about but was so mistakenly convinced could endanger me and my family. It got me thinking about many things - human aggression in general, and how powerful our defence mechanisms are that could push us to do horrible things. This seemed especially relevant for this time of instability and violence in the Middle East. We need to all do some serious work overcoming our fears and learning how to be more rational and less defensive. This is only possible by building more trust with our neighbours, both human and animal, and getting to know them better. When you know something you can't be afraid of it. At least not as much as I was that night. A second week (in a row!) 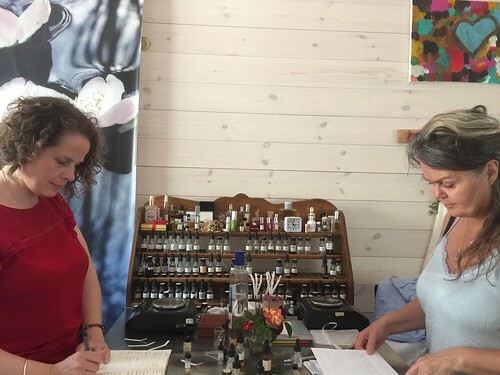 of intensive perfumery studies has come to a close: Floral Bouquet Week-Long Perfumery Course. 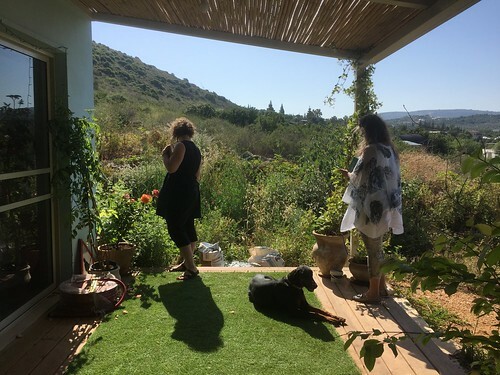 This is the fourth course I'm teaching at my new space, and I'm thoroughly enjoying all aspects of the new location: the proximity to the flowers and wild plants and herbs, the quiet atmosphere that truly allows for deeper studies and absorption of the materials (no city distractions for students means they can both study extra materials and get much needed rest between the daily sessions). Gardenia in all its fresh, dewy, tropical glory! 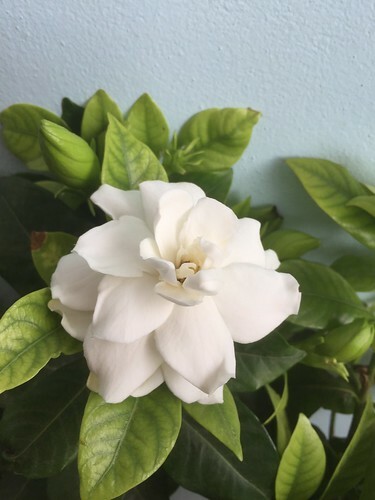 We were blessed with many beautifully fragrant flowers in bloom, such as the star jasmine and gardenias, which I could demonstrate enfleurage method though in a most direct manner. 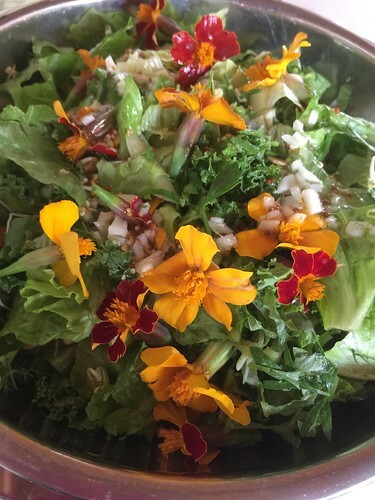 And even eat them for lunch in a lovely floral-fresh salad! There were a lot of dissecting modern florals - both purely natural and those containing synthetics, to get the feel for each one of the styles in which florals can be composed, and trying to create a match for each one of the representatives of the family (some of them you can see in the photo - for example: Vent Vert, Joy, Diorissimo, No. 5, Arpege, Apres l'Ondee and more). But of course, the focus of this advanced program was the composition and creative aspect. 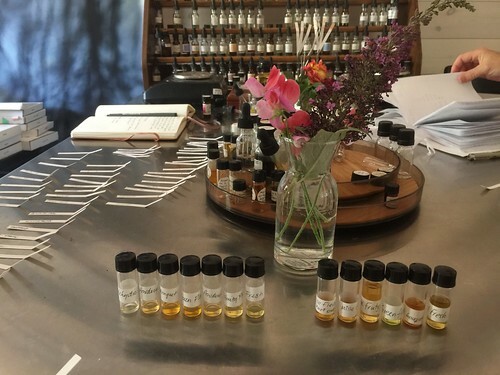 At the end of the week, each had at least five creations representative of each category, including the most challenging feat: a natural Floral Aldehydic!